This being my first non-drink post, I felt it only fitting to pay tribute to one of my most prized resources on the cocktail. I have had this book in my possession for many years. I do not remember exactly where or when it was acquired, but I am pretty sure it belonged to one of my grandparents based on the date of publication. It is none other than David Embury’s classic dissertation on cocktails, The Fine Art of Mixing Drinks. I have a dozen or so different books, another dozen websites bookmarked, and multiple apps on my phone that I use as a reference when trying new drinks or just looking for variations on old favorites, but Embury’s is by far my favorite and most used resource. It was not until recently that I realized that this book really is a treasure. One day when looking through it, I had the great idea to pick up some copies and give them as gifts to some of my friends. I figured that I could probably pick them up on Amazon for a couple of bucks each. Boy was I wrong! I quickly realized that my 1958 edition is by far the most valuable book I have ever owned. Depending on the edition and condition of the book, they sell for well over a thousand dollars. Needless to say my friends did not receive copies as gifts. If you are not lucky enough to find one in someone’s basement there is a 2008 edition available from Amazon . Regardless of its monetary value, its true value is that it can take you back in time. Embury’s work of art was written at the pinnacle of cocktailing. When cocktail hour and cocktail parties meant something. His recipes are not written by the beverage companies looking to promote their wares or the bartenders trying to make a few extra bucks. Perhaps I am a purist, but I like to taste drinks as they were meant to be made, before looking at the changes that have been make in the ensuing decades and passing judgment. As I have stated in the past, many of the current recipes attempt to mask the taste of the alcohol. The perfect recipe should balance the flavors so that they complement not only each other, but most importantly, the key ingredient. Even with something as simple as a gin and tonic, I want to be able to taste the gin, but not be overpowered by it, the taste of the tonic and lime need to be in perfect balance with the gin. The Old Fashioned is a perfect example. I have held off from writing on this classic due to the sheer number of variations in how it is made, and what is included. Depending on the source and the year published you may find a drink made with bourbon, rye or Canadian whisky. It may call for soda, sprite, water or grenadine. While some of the variations are quite good, it is hard to know where to start with so many versions available. Starting with a very simple recipe makes the search for the perfect recipe much easier. 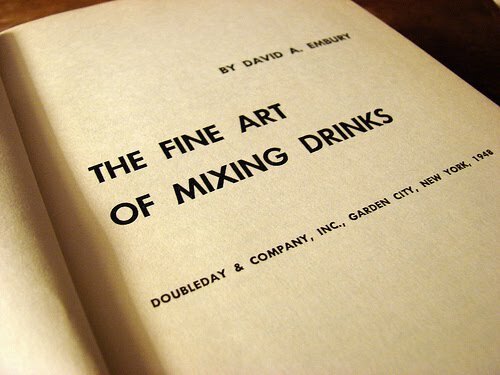 If you are fortunate enough to have a copy in your possession, look up your favorite drink and see what David has to say about it, give his recipe a try and see what you think. If nothing else, you have expanded your horizons and spent sometime with one of the classics of American literature.